Welcome to our quarterly newsletter of 2017 — updating and informing you, our stakeholders, about our activities and projects. The HDA is a national public development agency that was established by the Housing Development Agency Act of Parliament (Act 23 of 2008) to promote sustainable communities. This, the agency does through making well-located land and buildings available for, and leading and supporting the development of human settlements. 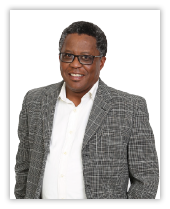 For more information on how the HDA is structured, how it works and what services it provides, visit www.thehda.co.za. 2017 kicked off to a very busy start and it promises to keep us running throughout, it would seem. This can only be great for a "Government's Developer" because it means we are breaking and moving ground all over the country. You will remember that on 21 November last year we hosted our first Annual Developers' Roundtable where we made public our revised mandate as an Agency. We are pleased to say that we are indeed in full steam as far as our institutional arrangements are concerned. We have repositioned the agency with the requisite personnel and skills it needs to dispose of its developer role. So, what does this mean for the Agency? It means the HDA will be packaging human settlements projects over and above our existing function of identifying strategic land parcels and making them available for human settlements development. In May of 2016 the Honourable Minister of Human Settlements, Lindiwe Sisulu, made an announcement about the national priority projects also known as catalytic projects. The HDA has been undertaking a meticulous process of re-assessing the projects that had been submitted. This process has seen us develop an implementation plan and we are certain that we will see the accelerated delivery in most of the government led projects. An extensive public engagement process will unfold in the coming months as we take the public with us in this journey. As required by law, we tabled our Annual Performance Plan and Strategic Plan last month in Parliament. As stakeholders we invite you to familiarise yourselves with what we will be focusing on in the new financial year.You can find both documents on our website www.thehda.co.za. We are indeed looking forward to a productive start to the 2017/18 financial year. 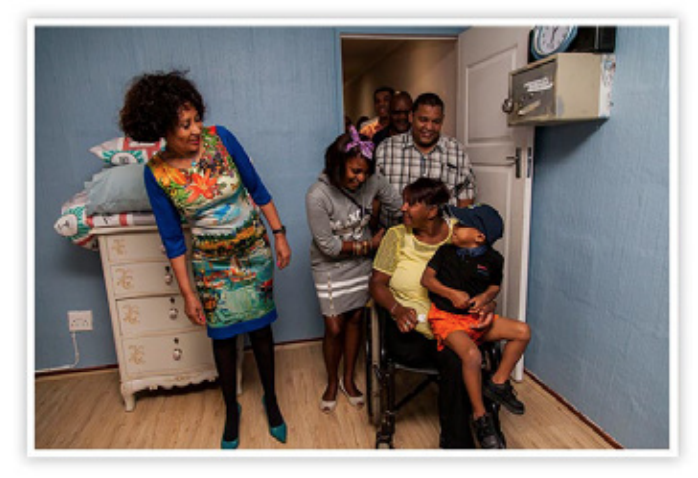 Arendse, who is bravely battling pancreatic cancer, was excited to see the Minister at his home. He is always joyful and what's more amazing about him is his cheerful smile, unequivocal resilience and will to live in spite of the severity of his illness. On two occasions, the doctors were convinced he will not live beyond a few months but the country saw him defying cancer odds. It was reported that in June 2015, doctors had given him just three months to live after he was diagnosed with stage four neuroblastoma — a solid cancerous tumour that begins in the nerve cells of infants and young children. The young man's strong spirit has captured the Minister's and many people's hearts in the country. The boy's grandmother, Margaret, could not hold back her tears when she and her grandson arrived at their renovated and furnished house with new furniture and appliances. "The Minister's visit last month has brought so much joy to my boy, I am grateful to the minister and her team. I realised that she has compassion and motherly love", said Margaret. "I was amazed when I arrive at home. The house looks very beautiful with the furniture. I know my boy is sick but to see such happiness [in his face], means the world to me", added the Margaret. "This is my superman, this is my superman! "cheered the Minister while inspecting the house and carrying Junaid in her hands. "I would like to thank everyone who has contributed to this boy's happiness. It shows that South Africa has caring and loving people," added Minister. The HDA in collaboration with the Ministry, project-managed the house make-over and rallied other organisations from government and private sector to contribute with their time and resources to make this project happen. The Housing Development Agency has partnered with the Gauteng Province to complement provincial capacity in the delivery of human settlements. Through this partnership, which officially began in January 2016, more than 5000 housing units will be built over a two year period. To date, of the targeted 2330 units in 2016/17, 1731 units have been completed. The projects are located in four municipalities in the province, namely City of Johannesburg, City of Tshwane, City of Ekurhuleni and Mogale City. In the main, the projects address the housing need of households residing in the informal settlements within the province. One of the targeted informal settlements will be eradicated. This is the informal settlement known as Tudor Shaft, located in Mogale City. This settlement is not suitable for human habitation and is considered to be one of the most dangerous informal settlements due to higher levels of radiation. 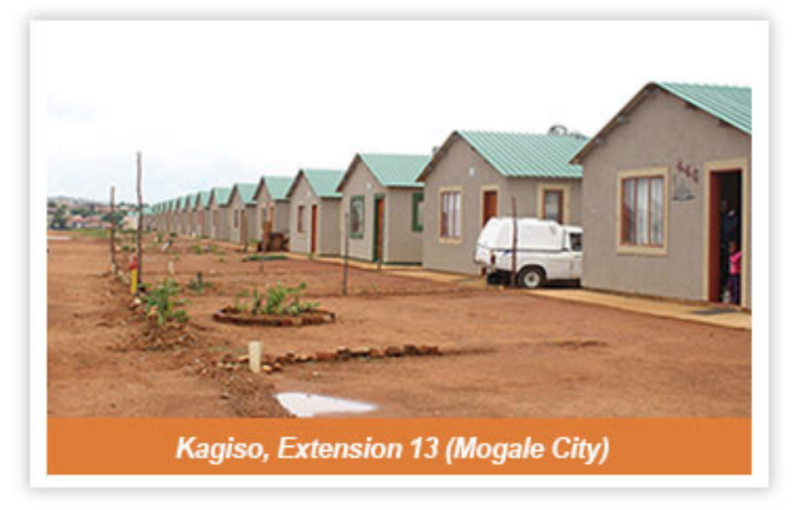 The HDA in conjunction with the province and Mogale City identified suitable project area known as Kagiso Extension 13 to resettle the households. 723 units are planned on this development, of which all services have been completed and 500 units are already completed. The Agency has identified poor project planning as part of the reasons why delivery has slowed down within the province and therefore, seeks to ensure that of the assigned projects, same are timeously prepared to ensure that projects are ready for implementation. The Agency is planning to deliver over 3000 housing units in the 2017/18 financial year. 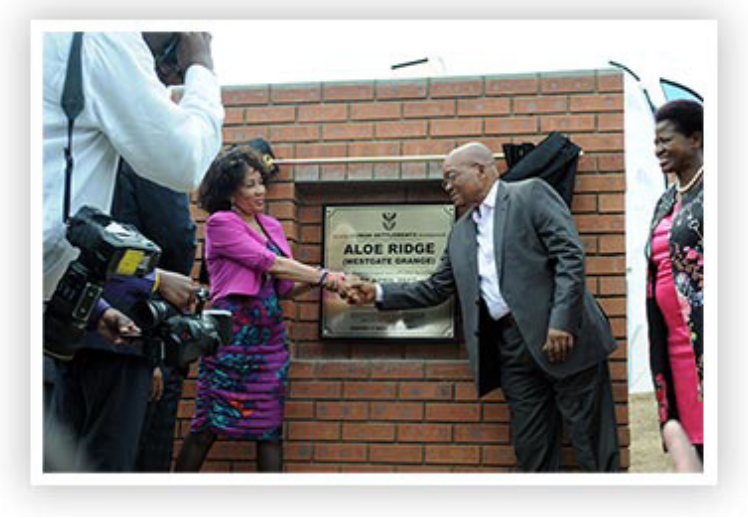 The Westgate Social Housing Project, known as Aloe Ridge was officially launched by His Excellency, President Jacob Zuma on 1 April in Pietermaritzburg. The HDA joined forces with the Department of Human Settlements and sister agencies as well as the provincial and local municipality in organising this launch, which is the biggest social housing project in the country. The President was accompanied by Human Settlements Minister, Lindiwe Sisulu; Deputy Minister of Human Settlements, Zou-Kota Fredericks; KwaZulu-Natal (KZN) MEC of Human Settlements, Ravi Pillay and other local leadership in KZN. "We are a government that will never rest until every South African citizen lives in a decent shelter. Our resolve is to restore the dignity of our people through human settlements", said President Zuma. "Projects such as Westgate Social Housing provide tangible proof that we are a country where people and children from all racial and cultural backgrounds can live and play together" added President Zuma. Ms Donnelly (living with her parents and her four-year old son) and Ms Msimang aged between 21 and 30 were overjoyed as they received keys to their new homes. "I feel good living here, especially for a person with my salary bracket; it isn't easy to rent on my own. The place is beautiful and security is on par" said Donnelly. The project is a direct positive response to the housing needs of the "gap market" those who neither qualify for the fully subsidised housing programme nor qualify for the bonded houses. It was developed under the Social Housing Policy for households with monthly incomes between R1500 to R7500. These rental units are made up of two bedroom units, each with an open plan kitchen, living area and a bathroom. It is project expected to provide decent and affordable accommodation to more than three thousand people. "This is a clear expression of our stated commitment to advance radical socio-economic transformation." Said the President. In late 2015, the President also officially launched the N2 Gateway Project in Cape Town, which is the biggest low cost housing in the country, of which the HDA is an implementing agent. The DHS is indeed making an immense dent in the housing backlog of South Africa. Thus far the DHS has delivered close to 4,5 million houses and opportunities since the dawn of democracy! In 2012, the national Department of Military Veterans (DMV) and the national Department of Human Settlements (DHS) signed a Memorandum of Understanding (MoU) towards the provision of housing for military veterans. In Limpopo province, a total of over 400 beneficiaries that are on the national database of military veterans are in need of housing. The HDA was appointed by the department of Cooperative Governance, Human Settlements and Traditional Affairs (CoGHSTA) as the Implementing Agent for the programme in November 2015. The HDA's role is to manage and facilitate the implementation of the project. At the time of appointment, the department was recovering from the slow delivery of 2065 units in the 2014/2015 financial year. The department had at the time, a recovery plan to meet the targets for both 2014/2015 and 2015/2016. Due to this, as well as the complexity of the programme (such as units being scattered over various areas within the municipality) the provincial CoGHSTA requested the HDA to assist in implementing this project. The project started in late December 2015 with the initiation stages, sourcing of housing plans and structural designs. The actual construction only started in mid-July 2016 with the total allocation of 132 units. In Limpopo, this project is implemented for the first time. CoGHSTA adopted a 75 square metre house — unlike in other provinces where the standard size is 50 square metres in area size. For the first time in the country a 75 square metre floor area houses for military veterans are built using the standard quantum amount of R188 884.00. The house consists of three bed rooms, kitchen, sitting room, bath room and the carport attached to the building. It is finished with concrete roof tiles, ceiling boards, aluminium patio window frames and ceramic floor tiles. "The project has presented numerous challenges but with a dedicated HDA team we managed to make strides in the area" said Rhudzani (Project Co-Ordinator: Region B). 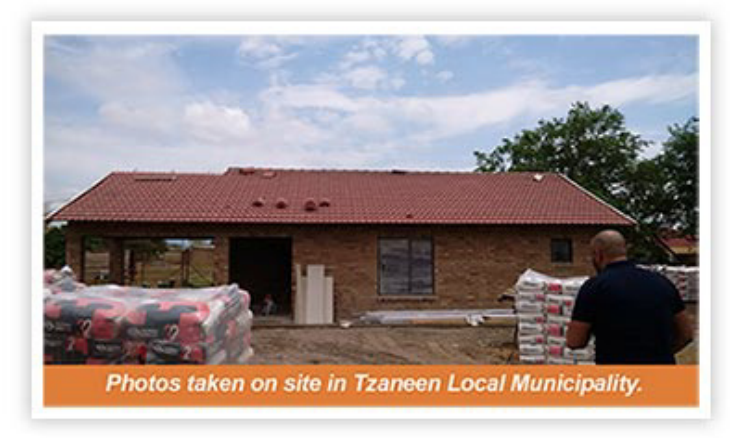 The houses are located in Greater Tzaneen Local Municipality, Polokwane Municipality and Thulamela. These are at various stages of completion. Some of the challenges also include the fact that the finishes require more special attention and more time to complete individual units. Furthermore, the fact that these units are too scattered over various areas in the municipality, makes it even more complex to speed-up the construction process. Our Limpopo team is confident that this process would be completed in the shortest time possible. The work is set to be completed by September 2017. The community of Tshwane was overjoyed to see Minister of Human Settlements, Honourable Lindiwe Sisulu visiting human projects and interacting with community member on Friday 31 March 2017. The visits occurred in Nellmapius and Bronkhorstspruit within the jurisdiction of the City of Tshwane Metropolitan Municipality in Gauteng Province. The principal purpose was to engage with communities on grassroot level, listen to all challenges experienced within these two communities and formulate task teams which will work closely with communities in resolving the challenges and improving both lives and living standards of our communities. Further, the Minister's visit formed part of oversight leadership engagements with local councillors and other community based organisations. 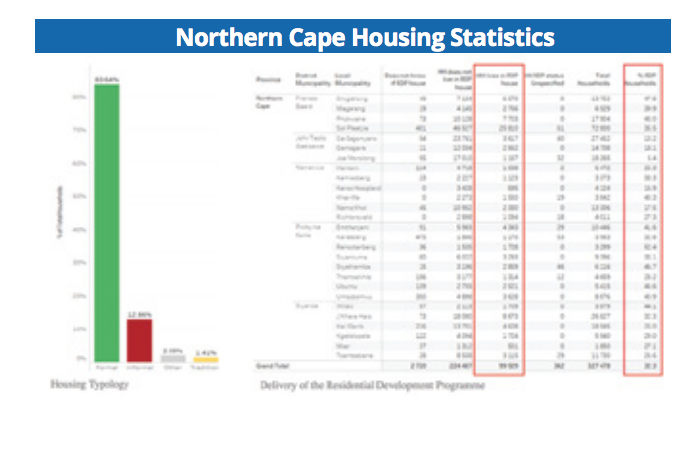 Northern Cape Housing Statistics The Minister gave a very pointed speech which was warmly welcomed by community members. "Every project will result in the issuing of Title Deeds and we will also form Youth Brigades in the area" said Minister. City of Tshwane has a mandate to reduce housing backlog within its jurisdiction and Nellmapius ext. 24 requires 2663 units to be constructed to accommodate the housing demand in the area. 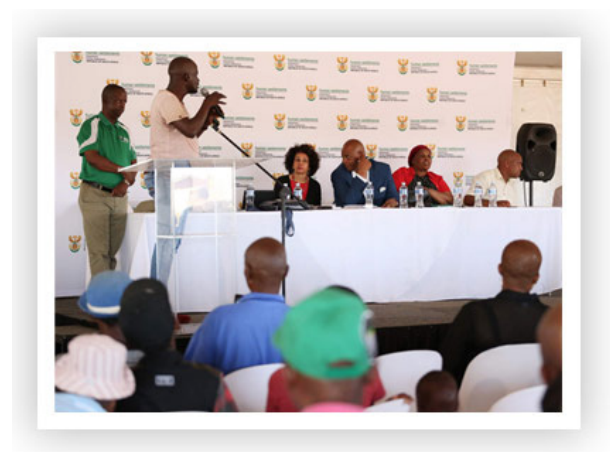 Therefore, Housing Development Agency has partnered together with the Gauteng Deparment of Human Settlement, City of Tshwane, local Councillors and Community at large to join forces in addressing the existing backlog. All houses are constructed in terms of Minimum Norms and Standards of the Department of Housing of Gauteng (GDHS) and are Quality Assured. The Housing Development Agency has appointed three Contractors to fast-tract the implementation process, which will contribute towards attainment of departmental goals and HDA's strategic objectives. Other project in the include Nellmapius Extension 6, Mahube Valley Extension 2 and Temba View Ext. 1 which are expected to deliver more units in this current financial year.